Why Stop Marketing Your Home as Soon as Your Visitors Come in the Door? Advertise the inside of the house too! Your buyers don't know what the dimensions of the master bedroom are; they might not notice if you have a gas or wood burning fireplace; or if one of your bedrooms is just perfect for the den, studio, or nursery they need. With all the other marketing elements in place, there will be so many visitors coming through your open house that you won't have time to sell your home’s features to each and every potential buyer. That’s the function of the Indoor Sign Kit. It's easy. It's professional. It comes ready to use. This kit positions your home's interior — yes, all rooms — for high impact marketing during your 5 Day Sale. The ingenious one-of-a-kind marketing kit answers your visitor’s questions, points out the features of the home. In 1 hour and 59 minutes you'll be able to transform your home into a "talking home" that people will definitely remember. You can post all the measurements and details on these professional, ready-to-print-out signs throughout your home. It reduces the time you spend answering the same questions over and over, and gives you more time to meet and greet, and gather starting bids! 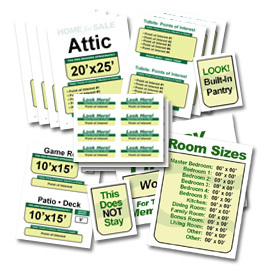 The Complete Real Estate Sign Kit™ is guaranteed to improve the results of your sale. There is nothing else like it available to home sellers!